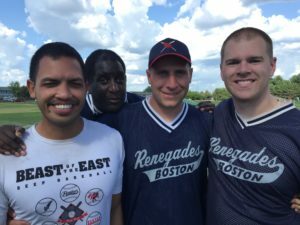 East Coast beep baseball is growing and for the first time ever, 5 teams from the northeast made the trip to the World Series. The Philly Fire had never been to a World Series under this brand. They last went under a different name, the PA Wolfpack in 2008. The Fire’s lineup had three starters who were not available when these two teams faced off in Rochester. 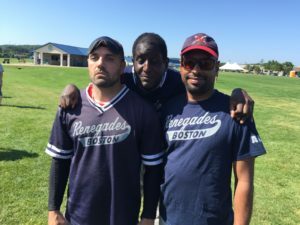 Also notably missing from the Renegade lineup was 2018 MVP, Christian Thaxton. 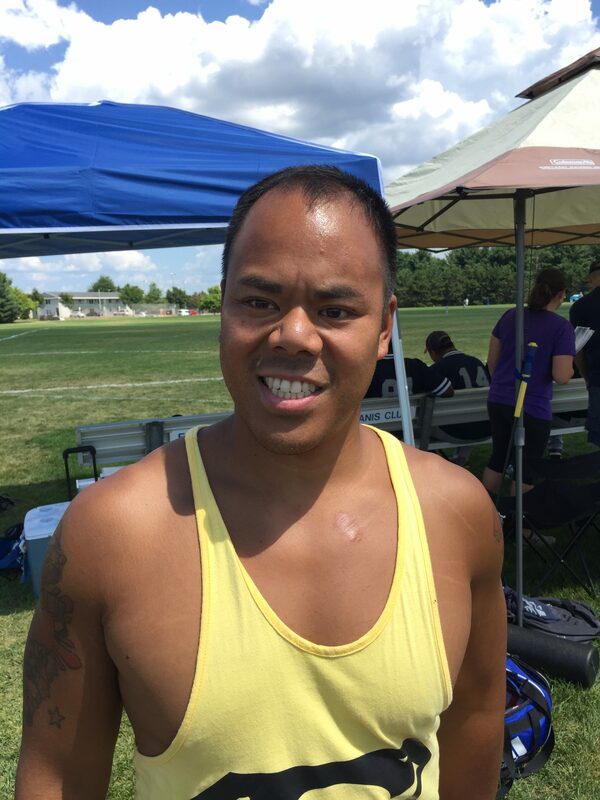 He was out of the match recovering from a concussion he received in practice 2 weeks earlier. Boston would come out with a new defensive alignment for the first two hitters in the Philly line up. Justen Proctor would make a stop in this shift to get the defense going. In the bottom of the first, Boston would start slowly as Rob Dias scored the lone run on a shot into left for the Gades. Mike Coughlin would make two stops in the frame to keep Boston at bay. Boston would flash some defense in the 2nd when Guy Zuccarello made a nice stop off the bat of Dan Kelly. Larry Haile also made a fine stop in deep left off the bat of Jeremy Capoti. In the second, Rookie, David Sanchez got things started. Facing Cochran, he hit a high pop up down the third base line on the first pitch. Peter Connolly came to the mound making his World Series debut in just his 2nd year pitching. With three strikes, Guy Zuccarello, laced a line drive up the middle. Back to Cochran, Joe McCormick struck out on 4 swings and misses. Rob Dias hit the first pitch he saw into deep left and then Larry Haile laced a liner to left as well for a run. This brought Sanchez up for the 2nd time in the inning. After hitting Cochran with a bouncer for a no pitch, he laced a line drive up the gut on a 3 strike count. Boston sent 8 hitters to the dish in the 2nd and the score was 6-0. John Margist got Philly got on the board in the 3rd when Shawn Devenish over ran a ball at third base. That would be all for Philly as Larry Haile made his second stop of the game and the season to end the inning on a play in left field. A break through game for Haile, who had lengthy discussions about his need to relax on defense with his team on the ride to Wisconsin. The bad news was that both teams suffered injuries. For Philly, they lost rookie speedster, Justin Rhines to a hamstring pull in the 5th inning. For Boston, Sanchez also got hurt on his final run when he banged his knee into the ground hitting the base. This win for Boston would mark its 9th win in a row. In the first ever match up against Toronto, Weissman decided to rest most of the starters to start this game. The Renegade coaches did not expect to see such a great Toronto defense. The constant on this day would be the strong defense of Boston, regardless of who was on the field. Justen Proctor stopped two Blind Jays in the first inning. Larry Haile led off this game with a hard grounder to the right side that looked like a sure run. Sun Gun Bae looked like he was going to let this ball get by him. However, he hit the ground at the last second making a spectacular play to take it away from the Train. That would not be the case later in the inning. He would not stop Joey Buizon who laced the first pitch he saw from Cochran into right, for his first World Series run since 2009. The top of the second was time for Buizon to shine on defense. He made two stops of his own while playing the right shorty position for the Gades. Justen Proctor hoped to have a big day at the plate after his 5 run performance against the Lightning in Haddonfield, two weeks earlier. He got off to a good start when he hit a hard grounder to the right side but was stopped. When asked later, he admitted, he had not run 100% because it was the first time he had run all day. That was not a good omen. In the bottom of the third, Buizon would plate his second run with three strikes on him to give Boston a slim 2-0 lead. Proctor had another chance at offensive glory, but after hitting a nice shot into right, he missed what was possibly, his first missed base since 2011. In the top of the 4th, the Blind Jays got the bats going, but Boston flashed the leather.. Aqil Sajjad got into the action with a nice stop in the middle of the field. Next, Buzion made his third stop of the game. Then Aaron Prevost hit a grounder thru the left side that had eyes. On that bang-bang play. Prevost scored as Luis Soto lifted the ball. Toronto had cut the Renegade lead to 2-1 and they erupted as their 6-hole hitter had scored. Toronto was showing they could hang with the Boston bench. In the 4th, Weissman brought Rob Dias into hit for Haile and Dias lofted a high fly to center. Three steps before he reached the bag, Cassie Orgeles picked the ball clean off the ground while standing up. Cochran and Weissman were wowed. It would get better. Quintanilla hit a 65 foot dribbler where only a lace was in fair territory on the first base line. Aaron Prevost would range to his left and nail Q before Joe was near the base. In the top of the 5th, bad news would hit Boston. Joey Buizon hit a shot into right and took off toward third. In Buizon fashion, he talked to the ball as it left his bat saying “thats gone” and before he could finish his sentence, he was clutching his hamstring. He limped toward third for a run, but his day was over. Buizon represented more runs than all other 11 players in the lineup for both teams combined. Weissman was nervous. Toronto was hanging around and they were the home team. Joe McCormick entered the game, hitting for a struggling, Aqil Sajjad. He hit the 2nd pitch he saw on a line drive up the middle that looked like a sure run. Orgeles made one of the best defensive plays ever in beepball. She fielded the ball off a line drive on one hop and caught it in her hands chest high without bringing the ball to her body. It was if she could see it. Larry Haile would reenter the game in the top of the 6th and get an insurance run for Boston. The Renegades would hang on to win 4-1 in a game that was too close. Boston did pull of the victory while playing the second string team for most of the game, but the win was not easy and it cost the team the service of Joey Buizon. As Boston was finishing it’s game with Toronto, there was a lot of cheering coming from the adjacent field. The Philly Fire were locked in a battle with the Long Island Bombers. They would mount a come from behind victory to walk off on the Bombers by the score of 10-9. Even though this Fire team was not the same as the team in Haddonfield, it still took a toll on the Bombers. Combine that loss with the loss of one of their long Time volunteers and pitchers, James Sciortino who could not make the trip due to vertigo, the Bombers were dizzy. Their next opponent owned a 14 game winning streak against them. What once was a huge challenge for the Renegades, after losing 7 straight games to Long Island from 2002-2007 now looked impossible for Long Island. Things got no easier in this match when the coin toss went to Boston. Long Island did manage to plate a run off the bat of Alex Barrera (who fares very well against Boston) but it was all Justen Proctor from there. He made 3 stops in the first inning. In the bottom of the 1st, Boston did something it had only done 5 times in 238 tries. Boston opened the first inning plating eight runs to put the hammer on the Bombers. Joe McCormick, Rob Dias and Shawn Devenish all plated a pair of runs to lead the squad as they also got contributions from Larry Haile and Joe Yee. The hurt was on. The pain got worse for Long Island when Edgar Erickson was stopped by Guy Zuccarello to start the 2nd. Meghan Fink was stopped by Proctor and then lead-off hitter, Joe DeJesus struck out. McCormick, Haile, Devenish and Yee all scored again for Boston to push the lead to 12-1 after one and a half. It looked like a 12 run game was in the works for Boston. Again in the 3rd, Alex Barrera got a bite out of the Renegades with his 2nd run of the contest but that run was sandwiched by strike outs and another weak out to Justen Proctor on the left side. The hope was gone from the Bomber bench. Joe McCormick would plate his 4th run of the contest to lead off the bottom of the 3rd inning. Larry Haile would plate his third run of the game in the same frame and the damage was done. It was 14-2 and the 12 run rule was invoked for the 4th straight time between these two teams. For the rest of the game, Long Island stayed at the plate while the Boston defense made plays. Boston needed to record 9 outs to end the game. Boston’s defense made five stops led by Proctor who made 2 more to lead the team with 6 on the game. Shawn Devenish would also make two nice stops as he continued to grow as a defender. Aqil Sajjad came off the Boston bench to contribute with a stop of his own late in this match. When the dust settled, this contest was all Boston. Shawn Devenish proved to himself, his defensive work was paying off. He made 2 stops in this game compared to the 3 stops he had in his career at this point. Joe McCormick shook off a 1-7 start to the series by fixing his mechanics and getting on a roll. All in all, Boston got their mojo back hitting .609 in the contest (8th best all-time). They struck out just 3 times (13%) which was the best rate of the 2018 season to date. Boston finished round robin 3-0. It entered double elimination as the one seed for the 4th straight year and only the 5th time in history.